Aswan Nubian Museum is located in the Elephantine Island on the southeastern side of Aswan in Egypt close to the ruins of Abu. It was opened in 1912 and it features many artifacts from Nubia during the construction of the High Dam. Some discoveries have been found on the Elephantine Island that is why a new section was opened in the museum in 1990 to show the wonderful artifacts. Among the items that have been found, there were utensils, weapons, pottery, and mummies. There are a sarcophagus and mummy of a sacred ram, the animal associated with Khnum in the room at the right of the entrance. Each of those artifacts explains a specific facet of life on the island that dates back to the ancient time. The villa of Sir William Willcocks, who was the architect of the High Dam, housed the main part of the Nubian Museum. This villa was built in 1898 and became a museum in 1912. This building shows the beauty of traditional Nubian construction. The Ruins of Abu are considered an open museum that holds inside the great Nubian Civilization. Inside the ruins, there is a temple of Khunum, a step pyramid that belongs to the 4th dynasty, Satet Temple from the 18th dynasty, and there is a Ptolemaic chapel. There are also two Nilometers, which show the level of the Nile River and show if Aswan would enjoy a bountiful harvest or not. The Nubian Museum & the Ruins of Abu attract tourists because of their greatness and the beauty of their artifacts. When the High Dam of Aswan was built, the Nubian museums and buildings faced a huge threat from the flood. The UNESCO and the Egyptian government did a lot of efforts to save as possible monuments as they can as all the lands of Aswan drowned from the water of the Nile. 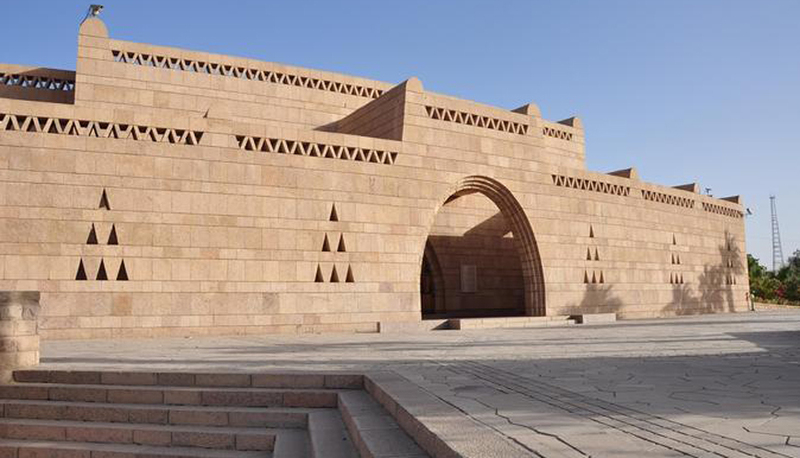 Muhammed El-Hakim designed Aswan Nubian Museum. He succeeded in constructing it to fit the surroundings. It covers around 50.000 square meters. The museum has a big importance in telling tourists everything about the Nubian history as every single architect has a note in Arabic and in English written underneath. The garden of the museum is the main important part of it as it exhibits around 80 statues and historical rocks that were dedicated to the gods of ancient Nubia in addition to some artificial lakes and waterfalls. Inside the Museum, there is a theater that has regular Nubian dances for visitors to show the unique Nubian folkways. The Museum has two floors. On the ground floor, there is the gate of the museum and the big exhibition halls. On the first floor, there is an information center, culture activities center, and another exhibition hall. The most important things of Aswan Nubian Museum include a bone comb with two giraffes carved on the handle, a vessel made out of an ostrich egg and decorated with incisions and a Paleolithic ax. There is an area inside the building called Group A, which demonstrates the relationship between the people in southern Egypt and the people in Nubia. In this section, you can find a polished quartz cosmetic palette used for crushing galena powder. It was used for eye makeup and a vessel decorated with a rowing boat with multiple oars, ostriches and undulating lines symbolizing water. In Group C, you can find the story of the new civilization that started in Nubia after the decline of the Sixth Pharaonic Dynasty, or the decline of the period of pyramid building. Inside this section you can find a Female figurine typical of the C group style, (dated c.a. 1900 – 1550 BC) and inscribed “basket” pottery. In the Ballena section in Aswan Nubian Museum, you find a pair of silver bracelets. The interesting thing about the museum is that it includes Christian displays such as a wooden Coptic cross and a Coptic prayer book with Coptic inscriptions. There is also Byzantine-style fresco from the church of Abdalla Nirqi, and a Fragment of a linen shroud depicting a human face. After Islam became an official religion in Nubia in 641 AD, an Islamic section was opened inside the museum that contains a child’s tunic from the Fatimid period, a tombstone from the Fatimid period, 968-1070 A.D. and a water vessel from the Mamluk period. The final section in the museum is about the modern life of the Nubians and it includes a silver pendant and anklets, a lot of Nubian handcrafts. Moreover, there is a Russian chain worn on the forehead by Nubians, and a pectoral jewelry piece named the Bey necklace. There is no doubt that Aswan has very beautiful attractions including the great High Dam, the mesmerizing Unfinished Obelisk, the fanciful Philae Temple in addition to the gorgeous Kom Ombo and Edfu Temples. There are also other Hidden attractions like Aga Khan Shrine and the beautiful Bazaar of Aswan but Aswan Museum is considered a very important tourist attraction that you can visit through our Egypt tours packages.